Can't get more precious than this! 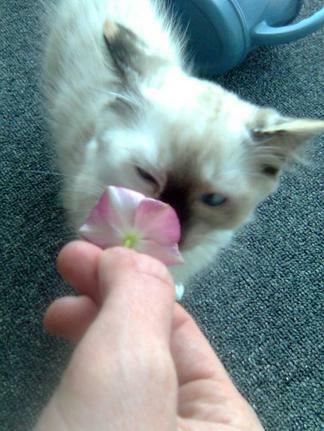 Trying to figure out if the flower is pounce worthy. Getting some yummy organic milk to calm her nerves on her first day home with us. Cute as a button! She completely fills out this bed now as long as she's curled up in a ball. Hunting the zoom lens on my camera. Playing with his girl Soph. She has the patience of a Ragdoll. Everything is a new discovery. Of the many beds in the house, mom's is always the coziest. Time with Sophia always brings him joy... and that brings me joy! The most beautiful tortie girl I have ever seen! Sophia is a perfect show!